The Treasure Hunt is the sixteenth gripping novel in Andrea Camilleri's bestselling Inspector Montalbano series. Montalbano opened the door to step out. But Gallo held him back, putting one hand on his arm. 'What's in there, Chief?' 'If it's what I think, it's something so horrific that it'll haunt your dreams for the rest of your life . . .' When a crazed elderly man and his sister begin firing bullets from their balcony down onto the Vigata street below, Inspector Montalbano finds himself a reluctant television hero. A few days later, when a letter arrives containing a mysterious riddle, the Inspector becomes drawn into a perplexing treasure hunt set by an anonymous challenger. As the hunt intensifies, Montalbano is relieved to be offered the assistance of Arturo Pennisi, a young man eager to witness the detective's investigative skills first hand. Fending off meddling commissioners and his irate girlfriend, Livia, the inspector will follow the treasure hunt's clues and travel from Vigata's teeming streets to its deserted outskirts: where an abandoned house overlooks a seemingly bottomless lake. But when a horrifying crime is committed, the game must surely be laid aside. And it isn't long before Montalbano himself will be in terrible danger . . . 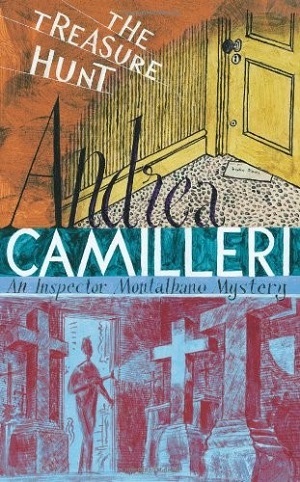 The Treasure Hunt is followed by the seventeenth Inspector Montalbano title, Angelica's Smile.